Studies have shown that digital POP signage provides more than ten times the eye-capture of conventional signage! Digital POP Signage is a growing phenomenon in all marketplaces where digital point-of-sale information has replaced traditional marketing materials. Digital Media Displays feature high quality LCD panels with built in speakers and a motion sensor making them ideal for retail display applications. Avante POP Displays provides 100% plug-and-play custom digital POP signage solutions which leading retailers use to deliver messaging to their customers where it matters most: right at the point-of-purchase. 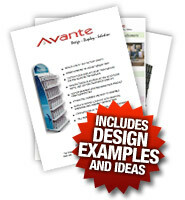 Why Consider Avante POP Displays for Your Digital POP Signage? In-House Production: Production is often overlooked in this industry. Anyone with experience will tell you that the durability and value of display is not solely in the design. Production quality means the world when you’re dressing your signage for lasting results. Imagine choosing an outfit for your top salesperson to wear to every meeting over the next two to five years. Imagine the importance of this selection in terms of overall performance. Everything from polish to wear and tear must be considered… and our signage is built with both polish and lasting performance in mind. Eco-Friendly Materials: The environment matters to us for a number of reasons, and for this reason we do everything we can to create our displays with the environment in mind. Our production team stays abreast of the eco trends in order to remain an efficient, responsible, cost effective manufacturer. Industry-Leading Performance: We at Avante realize that nothing matters more than your bottom line, and performance is what our digital signage design is all about. We continue to outperform our competitors by a large margin, and we will do whatever is necessary to remain well ahead of the pack…. Success stories are the driving force behind our company. Driving your sales team forward is our goal from day one. Digital signage has given Avante another format to incorporate into message, and this high-impact vehicle is continuing to astonish our clients who’ve chosen this hard-hitting format.